Reflections from current and past SCSFA Leadership Institute participants. 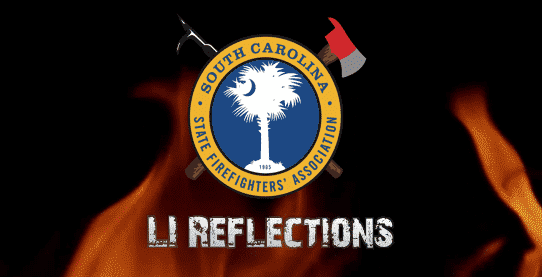 “I proudly completed the South Carolina State Firefighters’ Association’s Leadership Institute in 2014. The program has had a lasting impact on both my career and personal life. I met many interesting people during my year in the program, and I continue to develop those relationships to this day. The program opened my eyes to the broad expanses of our state’s fire service. I was fortunate to experience many presentations from a wide variety of departments throughout our state. We visited departments both larger and smaller than my own, and I learned from each of them. I heard perspectives from like-minded individuals that provided me with experiences that I would otherwise never have received. While traveling across our state meeting with different departments and political leaders, I learned a great deal about how the operational needs vary throughout the state. I also learned the challenges that many departments face and how they have been able to overcome many of those same challenges. I built lasting relationships with colleagues throughout the state that I continue to call on today. The network established as a part of the Leadership Institute has benefitted both my organization and me. Leadership Institute provided me with many skills that have allowed me to grow as a fire service professional. The program allowed me to broaden my knowledge base and expand my understanding of the fire service as a whole. It gave me an in depth look into the inner workings of the Association. It made me realize what all I had in terms of benefits through the association and how hard the associations works to better the state fire service as a whole. LI gave me a network of friends and colleagues that I would never have had…..
LI gave me a better appreciation for my own department, which I may have taken for granted prior to the program. “I can’t stress enough about how Leadership Institute established and helped to grow many professional relationships related to my career. While attending the program, I never imagined that several years later I would be using the knowledge and “friends” as much as I do today. A priceless example of how LI was beneficial was the 2016 Pinnacle Mountain Fire. During this 28 day wildfire, decision making was intensive, requiring many agencies to work together to extinguish a fire in which South Carolina had never seen before. The historic size and time frame of this incident, was a first for South Carolina. Having past knowledge and experiences allowed me to easily work with people, who I had previously met during my year in Leadership Institute. Many aspects of the incident, such as conference calling legislators and other elected officials, were critical to keep the public informed and make proactive decisions. Speaking with these elected officials and passing along the right information was something LI emphasized many times. “The year I spent in the Leadership Institute was no doubt one of the single most influential times in my career with the fire service. I learned so much about the fire service in our state that I never would have been exposed to had I not participated in LI. The great differences in the sizes and make-up of the fire departments was simply astounding to me. We visited career fire departments with multi-million dollar operating budgets and hundreds of members who seem to have all of the newest and coolest equipment. And on the other side of the spectrum, we visited volunteer fire departments with basically no operating budgets, purchasing fuel for the apparatus out of chicken dinner fundraisers, and with less than ten members. It was an eye opening experience to say the least and one that I brought back to our department members so that they could gain a little perspective on how blessed our department really is. Participating in the Leadership Institute also allowed me to gain insight into how hard the Association works for all of the members. Having spent many years in the fire service, my dealings with the Association typically meant preparing our 1% Fund Budget, sending in expenditure requests, and mailing in the required forms each year to qualify for the funds. I had no idea the depth of the Associations’ involvement into making the fire service better for everyone across the state. I had no clue there were committees of fire service personnel, across the entire rank structure, that were committed to improving the benefits to our members, increasing awareness of firefighter mental and physical health issues, and working daily with our Legislature to help us to protect our citizens better. I will say that the most important gift that my time in the Leadership Institute has given me is the huge network of friends that was created, not only from our LI class, but from all of the classes before my time and since then. Everyone who has been a part of the Leadership Institute knows that anytime they are in need of something, an LI Alumni member is just a phone call or email away. Whether it is a personal need, a sample SOG, or just someone to bounce an idea off of, we are always here for each other no matter what.